A shade sail is a sheath of cloth used to shade large areas and is visually similar to the sail of a boat. A durable, slightly flexible fabric is stretched over the exposed area and held taunt by several anchors on nearby walls, buildings or poles. The result is shade from the sun, UV rays (99%! ), bird droppings, and precipitation. A shade sail is an ideal addition to gathering spaces, such as large patios, decks, pool areas, and playgrounds. They are also frequently used on docks and boat slips to shield boats from harsh weather. Sun sails are also popular with commercial spaces. Not only do they make seated areas more comfortable for patrons, but they can also draw attention to a space and attract clientele. Shade sails are popular because they inexpensive (between $200 and $400!) and attractive, making them a great alternative to construction. If the exposed area is simply too large for a patio umbrella or awning, a shade sail is a very cost-effective alternative. These devices are fairly easy to set up and take down, and while they are typically used as a permanent fixture, a patio sail can also be implemented seasonally. Shade sails come in many shapes, sizes and colors, and can be layered to cover unusually shaped areas and create an interesting architectural affect. If you are considering buying a patio shade sail we recommend you use the following criteria for selecting the perfect sail for your particular needs. Size – Define the area you would like to be shaded and take appropriate measurements. Keep in mind the height at which the sail will be suspended, the direction of the sun and how sunshine will fall. (You should install a shade sail at a 20 degree angle to allow for water run off.) Is the space especially large? No problem. There are shade sails as large as 70 square feet! Shape – The vast majority of sun sails are available in triangle, square or rectangular shapes because corners allow the sheath to be pulled taunt. Decide which shape will best suit the area. 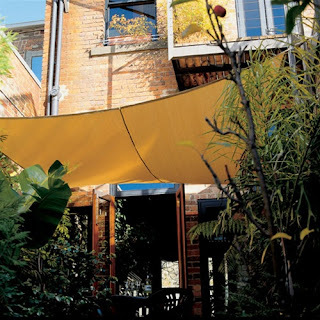 If your space is unique and difficult to define, there are custom patio shade sails as well. Color – Shade sails come in a wide array of colors. Choose a color that complements the space. Bright colors are great for a vibrant space or playgrounds. White and beige evoke a modern, elegant aesthetic. Brand – There are number of well-respected patio sail brands, including Coolaroo and SunSetter. These brands are the sun sail experts with an adept understanding of the fabric and engineering that goes into manufacturing quality patio shade sails. Whichever brand you use, ensure it uses premium, seamless, water-resistant fabric with lock stitching (commercial grade being the best of the best). Make sure corners are reinforced and that the shade sail is backed with a long-term warranty. There are a number of knock-off sails out there, but within a year’s time, you will see why they were so inexpensive. The sail will become worn and collect dirt much faster than a premium quality sail. About the Author: Derrick Riley is a Managing Partner at Patio Products USA, a subsidiary of Neighbors Marketing specializing in outdoor patio products for home or commercial use. As one of North America's largest distributors of outdoor entertaining products, Patio Products USA delivers a wide selection of patio fire pits, patio heaters and patio furniture covers.